President Muhammadu Buhari, has met with UK Prime Minister Theresa May at 10 Downing Street London on Monday. 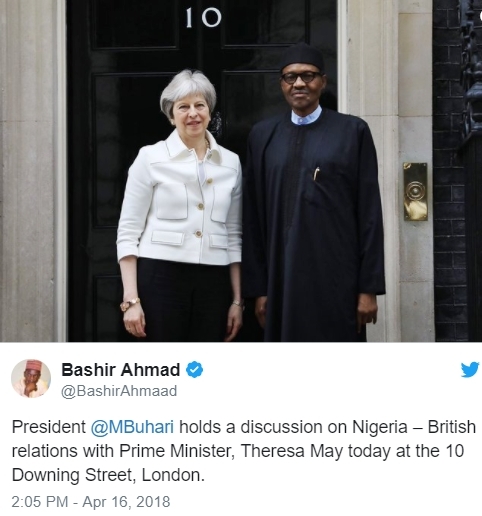 President Muhammadu Buhari, who travelled to the United Kingdom last week, earlier on Monday, held a discussion on Nigeria–British relations with Prime Minister, Theresa May at 10, Downing Street, London. The latest development was contained in the verified Twitter handle of The Presidency and the Personal Assistant to the President on New Media, Bashir Ahmad. As at the time of filing this report, the details of the meeting have yet to be made public.